I finally finished my fall mantel. I'm showing it a little later than I normally like, but I do show up eventually. 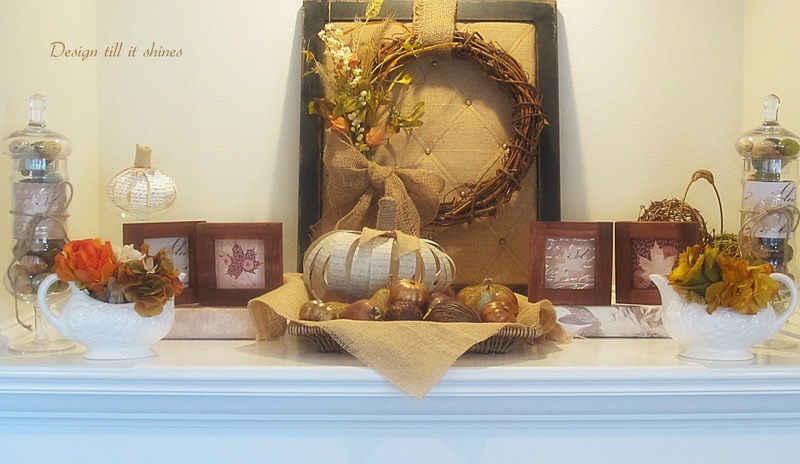 I love all the warm shades of brown this time of year, so I wanted a softer look for my mantel. 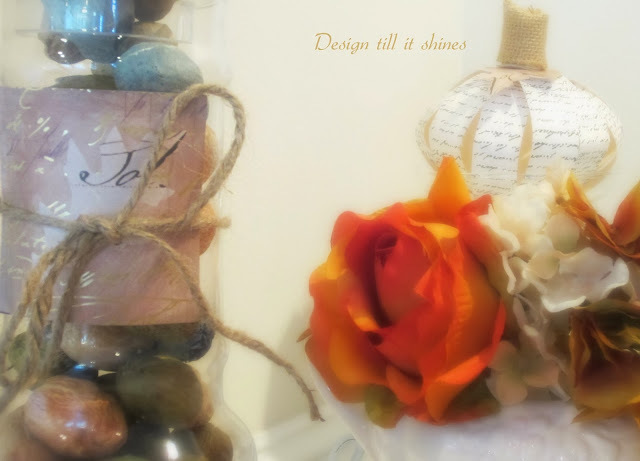 I decorated it simply adding a mix of things and also added some decorative scrapbook paper for an accent. I've blogged about this open area above our fireplace before. It is one of my least favorite features about our house. It's about 3 feet tall so many of the things I add to decorate it with look very small in comparison. I would love some large shutters to add as a backdrop, so hopefully I can get those before too long. I would also have to add some larger pieces to fill up this space, but since I'm thrifty minded I decided to go with a smaller display and focus on the details. 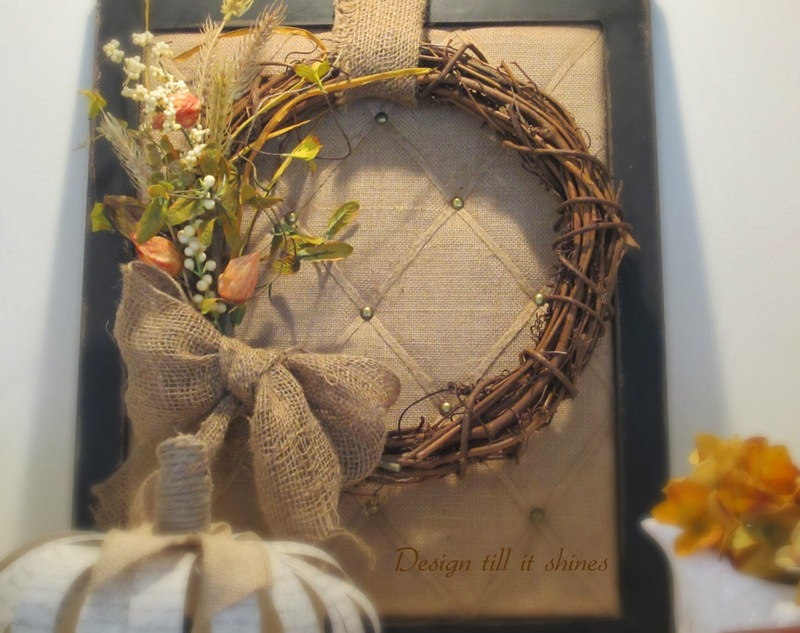 Since I love an easy project I put together this simple grapevine wreath with a shabby burlap bow. 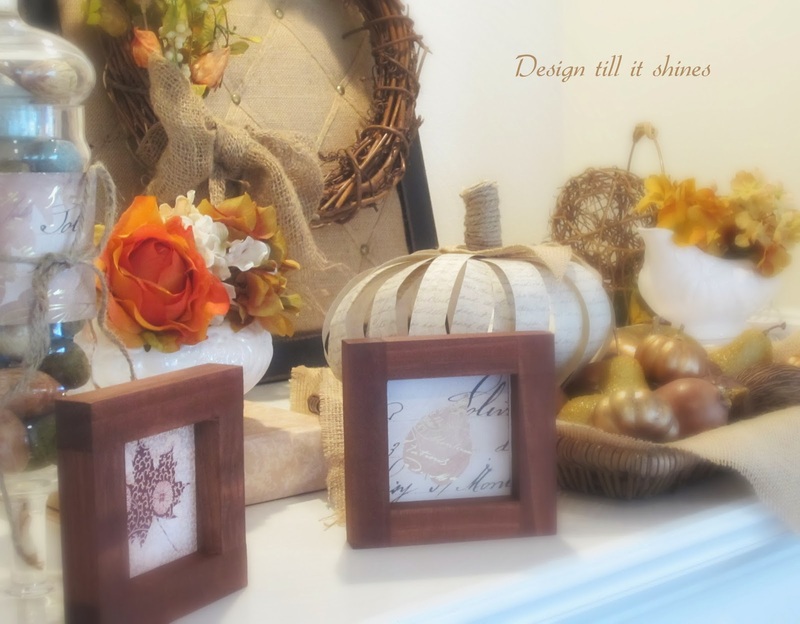 I already had the burlap and wheat on hand, so the cost was just a few dollars for the wreath, and I also added some decorative fall stems in soft fall colors that could also work for spring. I really like the texture it adds hanging on my burlap memo board. Since I enjoy working with papercrafts I knew I wanted to make a few pumpkins out of scrapbook paper. I found some frenchy looking paper and using strips, created my pumpkin with a burlap accent and jute wrapped stem. I forgot to show a tutorial on this, but it was quite easy to put together. The scrapbook paper was rather flimsy, so when I finished it I added a small straw to the center with some adhesive to prop it up, otherwise it would have been rather flat. Now it looks like a proper pumpkin! The other scrapbook paper was rather thick and I thought that would be better to make a pumpkin, but I didn't like the look so I just made a small frenchy one. 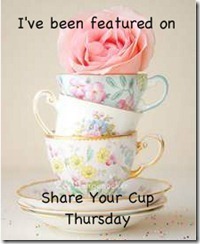 I had these white gravy boats with a fall design, so I added some faux flowers and used them as a container. 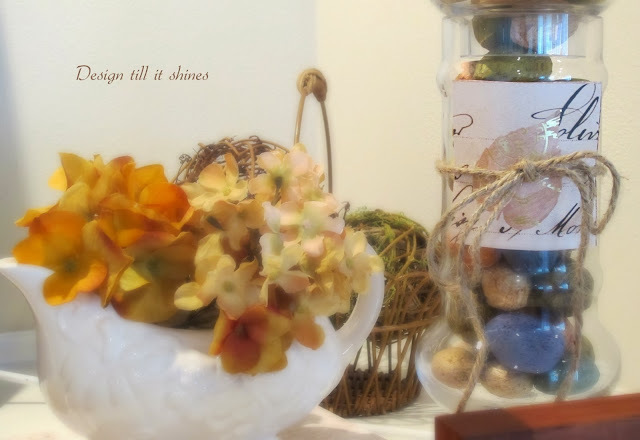 I filled my apothecary jars with some filler I had and included some decorative fall paper for an accent. 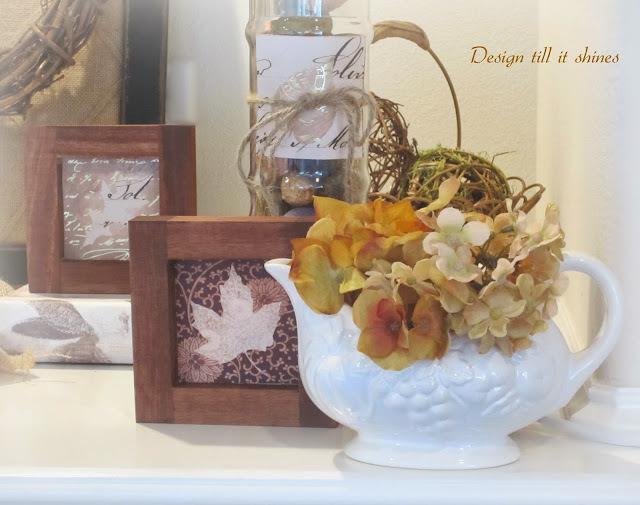 Last fall I saw all kinds of pretty wooden blocks in blogland with fall accents so I knew I wanted something similar for my fall mantel. 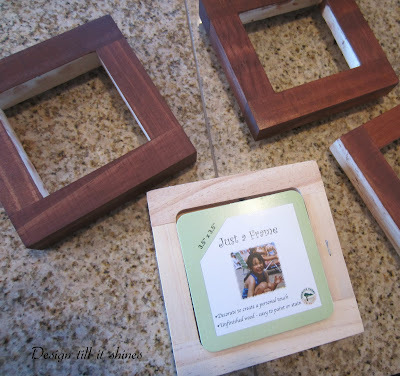 I couldn't find blocks in the size I wanted that would stand up, so I found these little wooden frames instead. I stained them in a soft chestnut color. 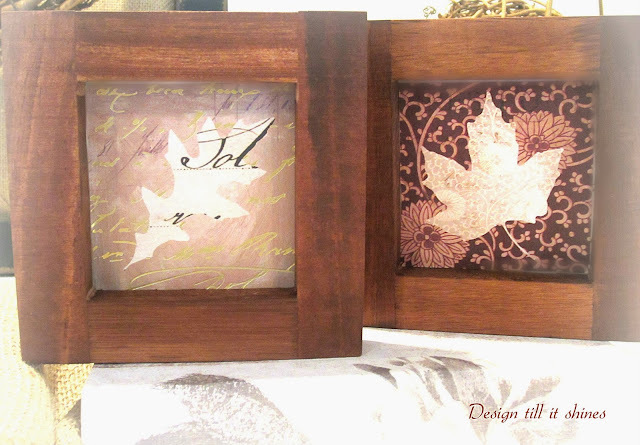 I found this decorative paper with the fall leaves and used it for my frames. I was glad I found this because I wanted to make a quick project and wasn't sure what to do, but when I found this decorative paper I knew it would be perfect. 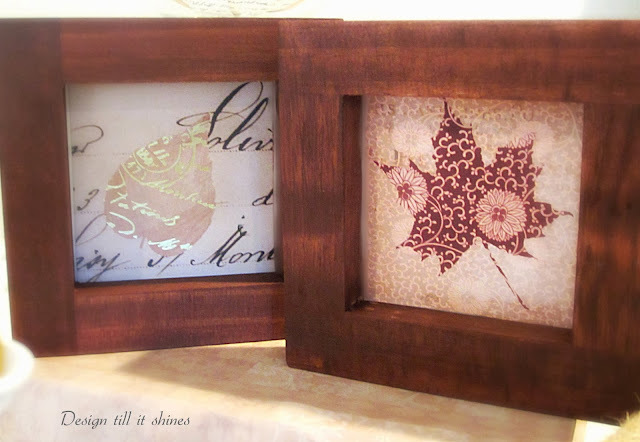 I thought it added such a pretty fall look to these little frames. I love the interesting leaf design on each one. All of them are so unique. 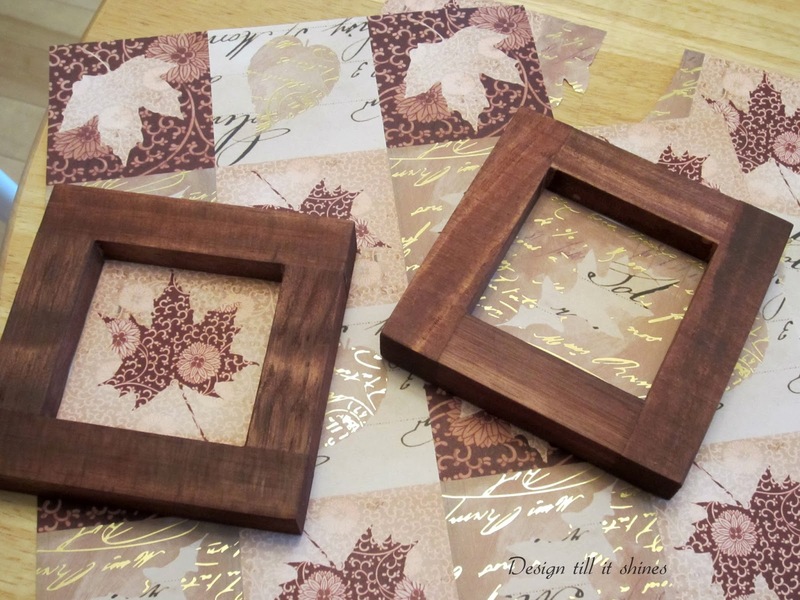 I found the specialty paper and mini wood frames at Joann's. With everything on sale the cost was under 10 dollars. 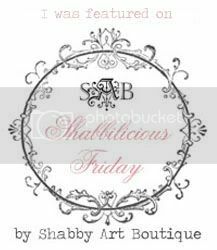 Lovely accents at a minimal price! 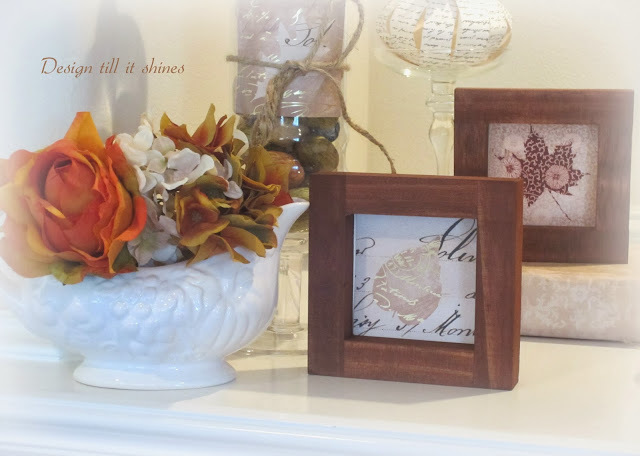 I love decorating for fall, but I don't have many fall accents in softer colors, so I was happy to find these. After I took this photo I thought the apothecary jar looked like a wine bottle with a decorative label. Or maybe it's just because I like wine! The softer colors of fall have always appealed to me. It's been unusually dry this month, usually by this time we have had more than our share of rain. So I'm really enjoying our fall in the Pacific NW for now. Just a little reminder to myself to enjoy it while it lasts. Your time and effort paid off with a lovely fall mantle. I enjoyed your previous post. Vancouver and Victoria are where we spent our 25th anniversary. Have you ever thought of trying an old window in the space over your fireplace? It may also look small but it could be a "canvas" for you to work with. 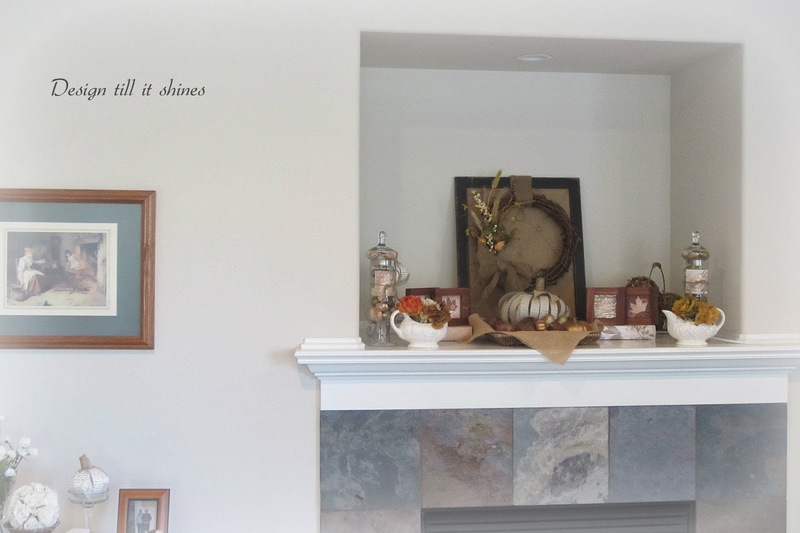 I have thought about a window, but I would prefer shutters because our cable connection is above our fireplace and I need to cover it. 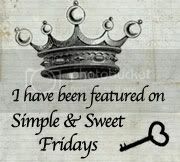 Thanks for the nice comments! All very beautiful. The mantel is so Autumn-ish. The 4 little wood frames with the leaves are very creative and nice also. What a wonderful and creative decorator you are! Lovely colours, textures and patterns here on you fall mantel, that create a cozy feeling that the season is so famous for! 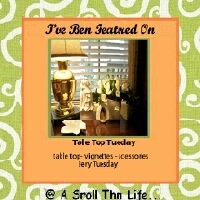 Enjoyed your photo effects, softening the vignette, and adding further comfort appeal. Beautiful. Your mantel is lovely! 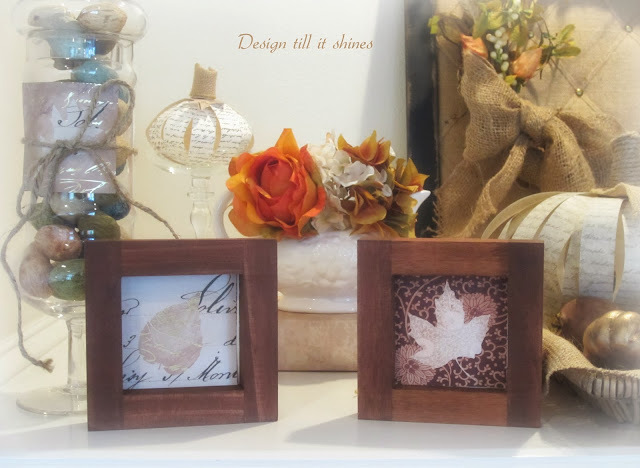 I really like the scrap paper pumpkins and the little frames! Just unique and wonderful touches. 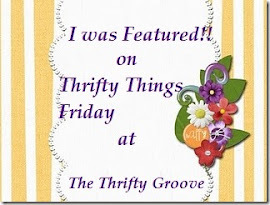 Thanks for linking to TTF! Your mantel display adds so much warmth to your room. I really like your paper pumpkin! Really pretty Diane. I love the paper pumpkin out of the Frenchy script paper. The framed leaves are so lovely also. Great job on it all! Thanks for sharing with SYC. A perfect fall vignette. 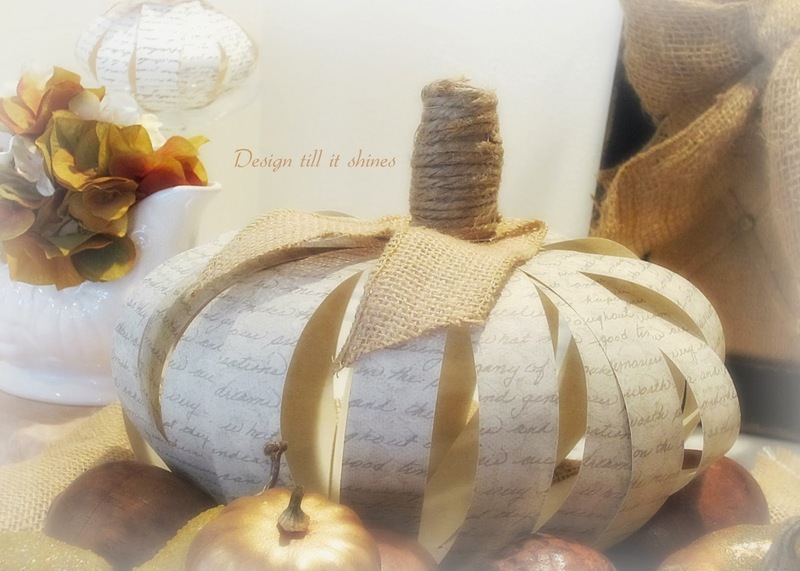 Love the script paper pumpkins, and adding flowers to the gravy boats, ... genius!